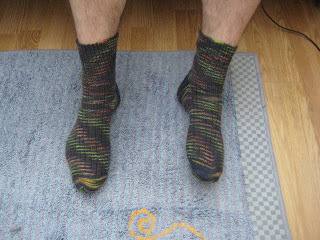 I finished a pair of socks for my father. This time I used the Austerman Step that Skacel sent me as a replacement for the duff ball. I dont know the name of this colour - but its jolly, and less lurid than I might have expected. Usual pattern, 72 sts on us 0 needles. I do like this yarn! I am getting ready to cast on my River Rock scarf. This is from No Sheep for You. 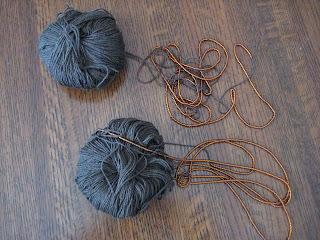 Christina and I both bought yarn for the project from Full Thread Ahead after we went on our knitting camp last year. 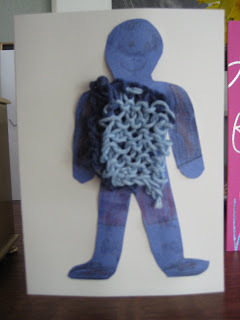 We plan to do it as a knitalong. My yarn is Naturally Dawn. Its a 50% silk/wool blend from New Zealand. I bought the beads at the same time from Full Thread Ahead on advice from Hollis. We decided on Friday to take a last-minute ski trip. 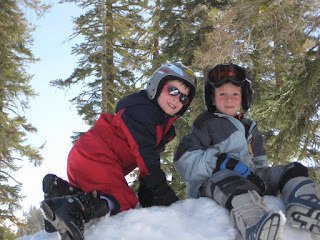 This time we did a day trip to Bear Valley: it's about a 3-hour drive from here, so it was a long driving day, but the weather was fabulous. 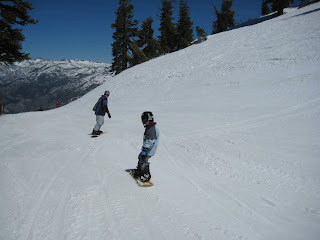 The downside of the glorious sunshine was that the snow was rather soft - but when you are learning to snowboard soft=good. No one else seemed to have the same idea as us , so we pretty much had the place to ourselves. Us, and a lift attendant from Newport IoW! I have finished my Lady of the lake jacket. This is a kit from Fleece Artist including Kid Aran yarn and curlylocks; a wool/mohair boucle. The jacket is knitted side to side which means that once you have committed to the size the length is pretty well fixed. 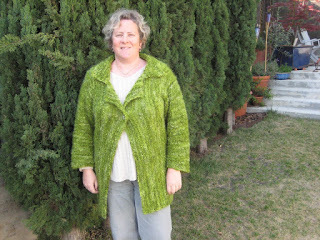 The jacket came out longer than I expected but I have not yet blocked it so will see what adjustments I can make. It looks a bit bulky in the picture - but I am wearing it over another sweater. I read other people saying how short the jacket knitted up before blocking so I knitted the larger size - but I will defer judgement until I do the blocking. The knitted fabric is lovely - the jacket is lightweight but warm and I expect to get a lot of wear from it. It is supposed to be closed with a pin, but I have some nice pewter buttons from Green Planet Yarn and may use one or two of these as closures. I think I can just poke the buttons through the fabric so will experiment with optimum placement. 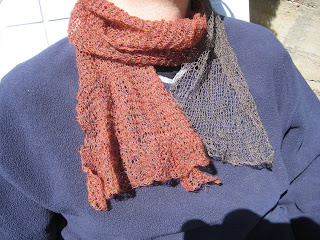 I also notice on Ravelry that other people are pinning higher up the front - so I will try that out too. I enjoyed knitting this - pretty mindless stitch pattern with minimal shaping. The yarns both felt lovely to knit with, once I got over the mohair making me sneeze. I still love the colour - even though it's refered to as the big booger in my house! I took this picture Saturday afternoon and love the colour of the water. 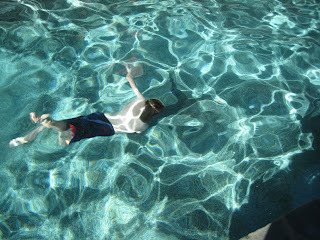 Frankly, it is too cold to swim in an unheated pool, but this has not stopped the boys! ps. For anyone who is interested the pool finish is Pebbletec in the Tahoe colour. (Tiny pebbles shotblased into plaster.) The actual colour of the pebbles is a sandy shade. I finished knitting the Kusha Kusha scarf. 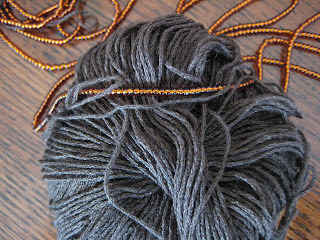 This is Habu kit 78 which includes 2 yarns: a fine merino (orange) and a stainless steel and silk yarn (grey). I bought the kit at Habu in New York in February. I cannot say that knitting this was a pleasureable experience; the steel yarn was, unsurprisingly, rather harsh and dried out my fingers, although not actually hard to knit with. The effect of the two yarns knit together is interesting and gives a texture and depth of colour that would be be achieved with a single yarn. The stainless steel yarn has a memory and a sculptural quality, but the overall fabric really has a nice drape. The scarf is a short length, as specified in the pattern, but I knitted until I ran out of the steel yarn, I have some of the orange left. 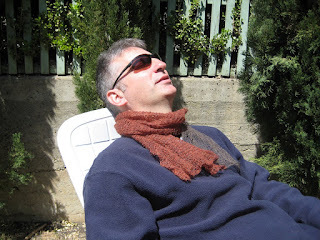 The intention is to lightly felt the scarf but I have not yet done so and may not as I like the current light fabric. I also dont think I want it any shorter. Nigel thinks it looks rather military surplus and has appropriated the scarf for his own use. 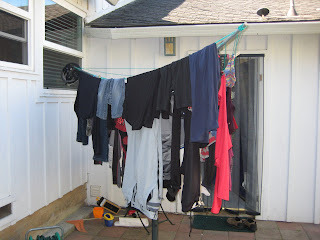 When I first moved to the USA I bought with me a rotary clothes line - they were not freely available here, and I thought I would continue to do what I had always done to dry my clothes and use an outside line. 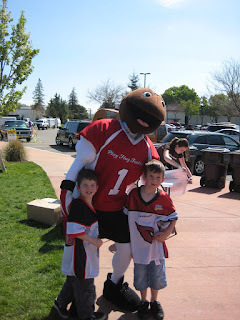 The arrival of children and convenience of a dryer seduced me away from my line and it went into the shed a few years ago. Following a conversation with Joyce I decided to resurrect my line and have started using it again. Not only do the clothes dry quickly, but they smell so much nicer, and I get that nice smug feeling of using less power. Why smug? Because here in Californina, despite perfect weather for drying clothes outside, almost no-one does it. Some cities have ordinances prohibiting drying clothes outside - for all I know LG does, it is that sort of place (my line is happily out of sight). Certainly using the dryer is easier, and the clothes require less ironing (or no ironing if you are not fussy), but the 10 minutes I spend hanging out or taking in the line is a nice break in the cool morning or evening, and makes me feel like a 'good housekeeper'...goodness knows nothing much else in my house makes me feel like that!! I knocked out another pair of socks for Nigel. Using my default sock pattern in a k3 p1 rib. 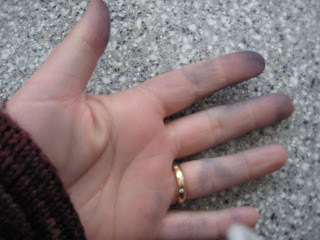 This is my hand after only an hour or so of knitting, the yarn leaked dye every time I knitted on them, and a lot of the dark blue appears to have washed out. 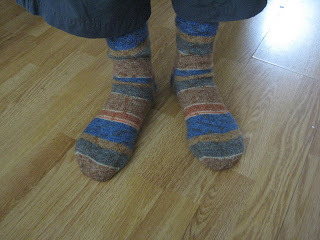 I washed them twice with jeans so far and the blue appears a softer shade than it was when I knitted them up. The finished object has received the Nigel seal of approval, but I'm not sure I really want to knit up the other skein of Tess's sock that I bought. Its a lighter blue so Im assuming the dye leakage wont be so bad, but I am much prefering knitting with the Austerman Step that is currently on the needles. I did see on Ravelry that other people were having problems with dye leakage - but the yarn gets raves on its long-wearing properties so that is good news. 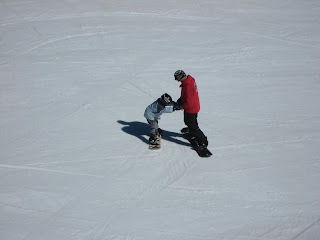 As previously mentioned, Adam was promised a snowboard lesson on the successful completion of a chapter book. 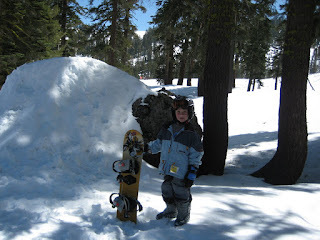 Of course, with this sort of motivation he quickly read "Horrid Henry Tricks the Tooth Fairy" and has been looking forward to snowboarding ever since. 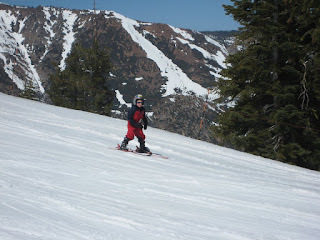 Although mid-April is the very tail end of the skiing season in Californina, we had a lot of snow this winter and there was still good coverage at Bear Valley. 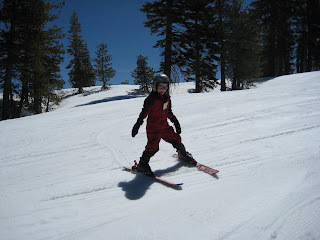 It was also a lovely change from our last trip, when we skied in a blizzard, to be skiing in glorious sunshine. 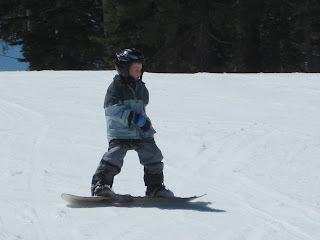 by the end of the first run down he was sideslipping on the board, and by the afternoon he was doing 'falling leaf' and 's' turns down the blue runs. 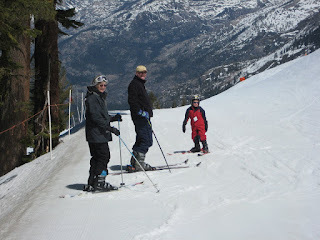 We had a lovely day, and it was the perfect way to celebrate Mammie's birthday - she was only disappointed that free skiing does not kick in at Bear until age 75...a way to go yet! Adam knitted the sweater with help from Nana - the perfect card for a knitter! So....Ferretworld had an unplanned hiatus...but we're back now after a couple of busy weeks. 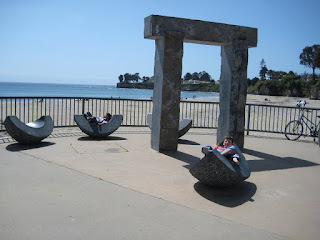 We also managed a day at the coast - this photo was taken on the front at Santa Cruz. 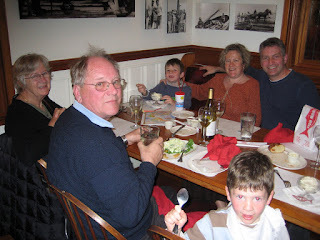 And naturally, there has been some dining!